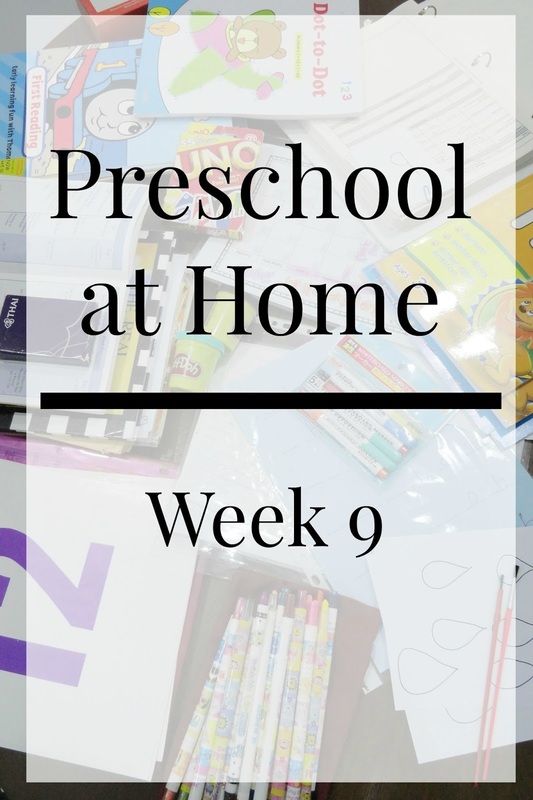 I've been dealing with a sore throat and a lack of ability to even speak like a normal human for the last week, so I'll be the first to say that this week's preschool is not the most brilliant, nor is it very teacher-centric. I enjoyed using my educational videos this week and didn't add an extra storybook because my throat couldn't tolerate the reading aloud. That's homeschool for ya! I think we still accomplish plenty, given the circumstances, and hopefully my dramatic reading voice will be back in business next week! -Write in the number of the day on the calendar each day. -Point out which day of the week it is. -Sang the Sing, Spell, Read, & Write letter sounds song. -Sing the short vowel sounds song. -Practice writing upper and lowercase letters with workbooks. -Found things in the house that started with the 'S' sound. -Asked, "Does your name have the letter S in it?" -Listened to the Letter S song. -We cute and glued paper into an S-shaped snake. -Wrote sat and sun on whiteboards. -Books 1, 2, and 3 from Sonlight's Fun Tales. -We practiced adding an end letter, too: sa-t, su-n, se-t, si-t.
-Teach Your Monster to Read for 5-10 minutes a day. -Sightwords: to, has, is, the, his, and I. -We also put together puzzles with pictures and words on them. The girls did a great job putting the puzzles together independantly, and I had them sound out a few of the words, but whoever designed these puzzles has never heard of the natural progression of phonics--silent e words, along with all manner of consonant blends and special vowel sounds, in a puzzle meant for preschoolers? I'm sure some preschoolers are at that reading level, but mine aren't, so I'm content to keep on working on the basics, making sure they really get the idea of letter sounds coming together to form words. The puzzle was fun. It would just be more useful if it included more CVC words. Bible and Storytime: Week 9 from Sonlight Core P4/5 Instructor's Guide. Months of the Year: We use this song. 7 Continents of the World: Memorizing the seven continents with this song. Telling Time: I use this song with a little clock that had movable hands. -We did a very basic intro to concepts having to do with Outer Space--discussing what we see when we look up at the night sky, etc. -The girls really enjoyed these space-themed educational songs from StoryBots: The Solar System Song, The Sun Song, The Stars Song, and The Moon Song. I think StoryBots is a channel I'll be going back to in the future--they aren't as packed with facts as some educational songs I've heard before, but they are really catchy and seem to be at a good level for my preschoolers, even if they don't yet catch everything that's said. -We drew and colored the Solar System on the bathroom floor with chalk--the floor-sized drawing helped us to picture the solar system on a grander scale than the typical drawing on an A4 piece of paper would allow. Obviously it's still not a to-scale diagram (is that even possible with the solar system?) but it gets the job done. -We practiced walking in the hallways nicely without running or screaming because we don't want to disturb the neighbors (yep, life skill right there).